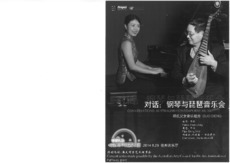 The program of the concert can be divided into three parts: the main element were the two Australian contemporary compositions "Five Songs From the East" for piano & pipa (a Chinese four-stringed lute), and "Choro" for piano solo both written by Australian composer Dr Grenfell Maria. The duration of these two pieces is around 32 minutes. "Choro" was written especially for the China tour. The second part of the program is six piano works by Chopin around 30 minutes, and the third part is two Chinese pieces around 16 minutes.